The publishing world has been swamped by “I deviated from the majority culture in a specific way for a year” books over the last several years. Books such as Nickle and Dimed: On (Not) Getting By in America and My Secret Life on the McJob chronicle the downward mobility of its authors and they lessons they learned as part of the minimum-wage work force in America. Other recent year-long life experiment titles include A Year Without “Made in China” and Plenty: One Man, One Woman, and a Raucous Year of Eating Locally. 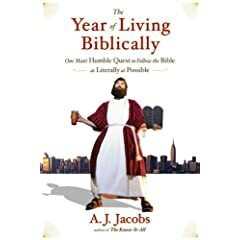 However, this recent release by AJ Jacobs, The Year of Living Biblically: One Man’s Humble Quest to Follow the Bible as Literally as Possible, stood out to me because of the implications it might have for those who follow Christ. You might recognize Jacobs as the author of 2004’s The Know-It-All: One Man’s Humble Quest to Become the Smartest Person in the World. As an aside, I love these extraordinarily long book titles. Credit (blame?) perhaps Dave Eggers and his book A Heartbreaking Work of Staggering Genius. From a friend’s blog, I have determined that I will either release an art-damaged indie orchestral single or postmodern semi-biography titled FINAL NOTICE: The Earth will fall into Null space. Does publishing that to my blog copyright this phrase? I might read this book based simply on the parenthetical aside, “I’m Jewish in the same way the Olive Garden is an Italian restaurant.” Delightful! A couple of pages from the author’s website stood out to me: You too can live biblically and How to be good, in particular. Now, while I understand that there is more than a good measure of smirky, tongue in cheekiness going on here, I also believe there are some pretty significant insights as well. For those of us who want to follow Christ, there is something so powerful in these words. Although our words say, “Jesus loves you just as you are,” the unspoken addendum to this phrase is often, “…if you accomplish a bunch of stuff for Him.” The Sabbath not only refuels us, but reminds us that we are not in charge. A few Sabbath-related titles: Mudhouse Sabbath, Sacred Rhythms, and Keeping the Sabbath Wholly. Now, back to the idea of picking and choosing which biblical commands we will or will not obey. In the end, this is an issue of hermeneutics — the lens through which we interpret and understand Scripture. Some well-intentioned folks will say things like, “I don’t interpret the Bible; I just read what it says.” Well, unless they are reading in the original Hebrew and Greek, they are interpreting it — actually, even if they were reading from the original manuscripts, the simple fact that the words are being processed in their minds means they are interpreting it. As Rob Bell writes in Velvet Elvis, “God has spoken, and everything else is commentary.” In other words, no one has a purely objective, agenda-free comprehension of the Bible. So, then, the issue becomes how we will interpret the Bible. Regarding obscure Old Testament commands (the non-shaving of beards, no cheeseburgers, etc. ), I have heard people try to brush them aside with, “Jesus died for us so we live under a new covenant. All that stuff is in the past — those rules no longer apply.” Unfortunately for them, the ten commandments are also in the Old Testament along with the commandment Jesus calls the greatest for His followers, so this approach would be a bit more than throwing out the baby with the bathwater. There is also the interesting question of how changing our outward behavior will change our inner attitudes (and vice versa). Sometimes, all we can do is obey even though our hearts are not in it — and, mysteriously, God changes our hearts through that. Because we cannot separate our bodies, hearts, minds and souls, it makes sense that the dynamics of transformation include all of these aspects of ourselves. Certainly, God cares about our hearts and wants us to be changed from the inside-out, but we cannot use that as an excuse for inaction — waiting and waiting for our hearts to be perfectly Christ-like before altering our lifestyles. I can only commend that Christ Himself would be the lens through which we will understand and live out the Bible. Many theologians, authors and denominational perspectives are helpful and necessary. We should seek the wisdom and guidance of others. But all of that is meaningless without a genuine desire to follow Christ and to live as He wants.